Anthony William, the Medical Medium, has helped tens of thousands of people heal from ailments that have been misdiagnosed or ineffectively treated—or that medical communities can't resolve. And he's done it all by listening to a divine voice that literally speaks into his ear, telling him what is at the root of people's pain or illness and what they need to do to be restored to health.In his first book, the New York Times bestseller Medical Medium, Anthony revealed how to treat dozens of illnesses with targeted healing regimens in which nutrition played a major role. 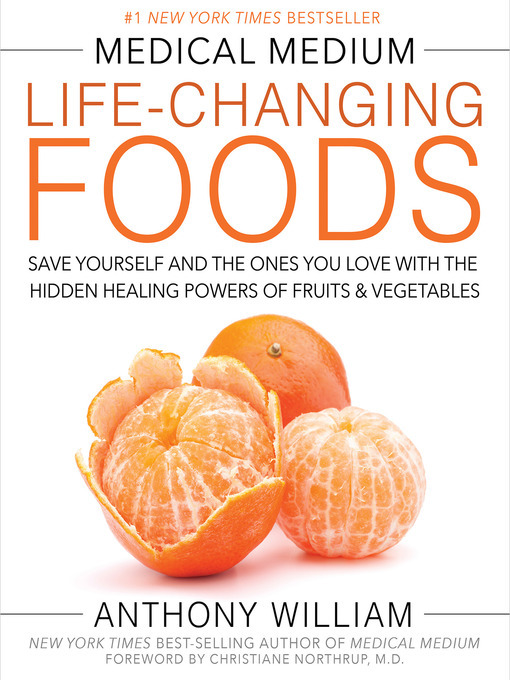 Medical Medium Life-Changing Foods delves deeper into the healing power of over 50 fruits, vegetables, herbs and spices, and wild foods that can have an extraordinary effect on health. Anthony explains each food's properties, the symptoms and conditions it can help relieve or heal, and the emotional and spiritual benefits it brings. And for each food, he offers a delicious recipe to help you enjoy its maximum benefit, from sweet potatoes with braised cabbage stuffing to honey-coconut ice cream and chewy apricot bars.You'll discover: • Why wild blueberries are the "resurrection food," asparagus is the fountain of youth, and lemons can lift your spirits when you've had bad news • The best foods to eat if you have gallstones, hypertension, brain fog, thyroid issues, or migraines—plus hundreds more symptoms and conditions that may be holding you back • The particular healing powers of kiwis, cucumbers, cat's claw, coconut, and much more • Insight into cravings, how to use stress to your advantage, and the key role fruit plays in fertilityMuch of Anthony's information is dramatically different from the conventional wisdom of medical communities, and much of it has never appeared anywhere before. So don't expect to hear the same old food facts rehashed here. Instead, expect to get a whole new understanding of why oranges offer more than just vitamin C—and a powerful set of tools for healing from illness and keeping yourself and your loved ones safe and well.